With our first big storm of the winter rolling in this weekend, we’re hunkering down and keeping warm with this Chili Hot Toddy. We pulled out our Chili Threads, which are made from dried New Mexico chili peppers for their smoky flavor. This eye-catching garnish is perfect for adding a touch of heat atop soups, seafood, and grilled meats. 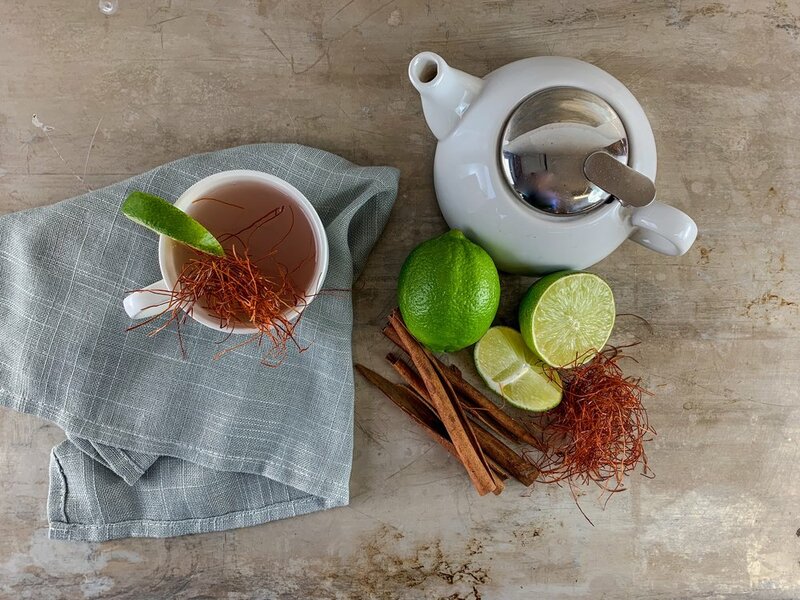 Prepare a spiced simple syrup by combining 2 sticks of cinnamon, two generous pinches of chili threads, ½ cup granulated sugar, and ½ cup water. Bring the mixture to a boil, then reduce to a simmer. Simmer for 10-15 minutes, then strain and return to the sauce pan. Add the alcohol, lime juice, and bitters then warm gently over low heat. Stir occasionally as the cocktail warms. Once the mixture is warm, distribute between four mugs. Garnish each glass with additional chili threads and a wedge of lime. Whether or not you’re participating in dry January, mocktails offer incredible and unexpected flavors with all of the fun presentation of a cocktail minus the booze. We’re kicking this series off with a Carrot & Green Cardamom Warmer, perfect for cozying up into the weekend. Bonus: we added in an alcohol suggestion for those not participating in dry January! In a small sauce pan, bring the cardamom, ginger, sugar and water to a boil. Simmer for 5-10 minutes, then remove from the heat and allow to cool. Chill two coupe glasses by filling them with ice water. Set aside. Add the syrup, carrot juice, lemon juice, and gin to a shaker. Shake vigorously for 30 seconds. Empty the chilled glasses, then strain the cocktail into the two glasses. Garnish with the skewers and serve. Use a vegetable peeler to create long, wide ribbons of carrot. Place them into a bowl of ice water, and set aside while you prepare the brine. In a small sauce pan, bring the vinegar, ¼ cup water, salt, and sugar to a boil. Remove from the heat, and add the carrot ribbons. Allow the carrots to brine for 10-15 minutes, or until cool to the touch. Make the skewers by weaving the carrot over a toothpick, breaking up the weave with slice of crystallized ginger every second or third fold.